Here's a universal replacement for the standard spark arrestors and rain caps that come with class-A chimney systems with solid-pack insulation. Standard caps often don't hold up for long, and the homeowner is faced with the need to replace them. This weathershield for solid-packed chimneys will get the job done. A tight, friction-fit installation allows the weathershield to slip down securely inside the chimney. this same system also ensures a tight fit on virtually any brand of class-A chimney with solid pack insulation. Similar brands will however differ in their inner dimensions by a few fractions of an inch. These weathershields for solid-pack insulated chimneys are available in 6" - 10" diameters. 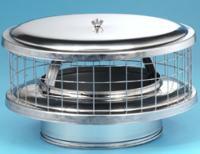 We also carry an additional weathershield that is designed to fit air-insulated chimneys. All styles of the weathershield feature a lifetime warranty. Fits 6 inch inside diameter. Fits 7 inch inside diameter. Fits 8 inch inside diameter. Fits 10 inch inside diameter.